2016 is an year where new technology trends started shaping across the world. It is hard to stay not be excited about them as these technologies are capable to transform the way operations carried out by business owners & marketers. Many organisations across geographies and from various industries are trying to shape their tomorrow by transforming their businesses by adapting new technologies. Virtual and Augmented Reality (VR and AR) the most enthusiastic technologies to be mentioned in this article. There's a difference between Virtual and Augmented reality.. to be specific Virtual reality is a computer generated simulation of a real life environment. It immerses the user by making them feel what they are experiencing primarily by stimulating their vision and hearing. Facebook's Oculus is one of the perfect examples to demonstrate Virtual Reality. To try and have fun here are other products as well at your budget levels. Whereas Augmented reality is a computer generated layer over existing reality with an ability of interaction to make users feel it meaningful. "Pokemon Go" game is one of the perfect examples of Augmented reality. "Augment- 3D" is one of the best apps to be used to create Augment reality. Here are "The Best Augmented Reality Apps" published by Digital Trends. To keep it simple Artificial Intelligence is to make intelligent machines and intelligent computer programs. AI is to make computers understand human intelligence. AI doesn't limit itself, it kept growing and self improvised to work as a personal digital assistant. AI algorithms provide us better search results and suggestions. AI started challenging humans and a breakthrough technology of it AlphaGo has taken down Go Master. You can find some AlphaGo games here at DeepMind. Artificial General Intelligence (AGI) is an emerging field (society) aiming at building "Thinking Machines". This Society has an aim at building general systems with intelligence comparable to that of human intelligence. AGI society is a non profit organisation, working to promote AGI and the design of AGI Systems. Data Science and Visualisation has got into more prominence since Big Data has come. These all are to manage data, organise, visualise and infer. Many organisations started showing interest in utilising the technology, they recruit data analysts or out source the projects to deduce from the unstructured / unorganised data they got. Data Scientists are the statistical adroit's who implement the concepts of Data Science, right from data collection, data cleansing, data mining and statistical analysis to forecast, to build predictive models and to finally optimise the data. Data science doesn't guarantee you on providing the exact solution but it ensures you having an optimised solution. This defining tech is used across the Web, Social media, Marketing, Health care and many more domains. Here is video on Data Science and its relevant statistical and visualisation tools (like RStudio, Tableau) usage from ExcelR. Machine Learning is an approach to achieve Artificial Intelligence, Deep Learning is technique for implementing Machine Learning. Deep Learning has enabled many practical applications of Machine Learning. Deep Learning is a sub field of Machine Learning focused on high level abstracted representation of data using multiple processing layers. People are excited about AI, Machine Learning, Deep Learning as they seem to be powerful tech. Some of the ML & DL interesting applications are Image Caption Generation, Automatic Text Generation and Text Translation, Coloring of Black and White Images, Object Classification in Photographs. If you are interested you can read in detail at "Machine Learning Mastery" . Video Streaming in Live gives an "in moment" experience to users, who will be able to see through someone else devices. This technology is going develop further, so hope to see more applications in future. There are big brands who perfected this technology like Facebook, Periscope, UStream are good enough examples to name. To know more on Video Streaming Apps visit Android Authority. Open Enterprise is a logic built on offering services across different enterprise applications, mobile apps and websites. It is something like offering themselves on other platforms as a service. Example, Payment Wallets and Cab Services. In detail, Uber cab services are offered through Google Maps app, Book My Show app. MobiKwik payment solutions are offered across Ola, Uber, Book My Show and many other apps. In this digital generation one should make themselves available across various platforms to gain advantage of awareness creation and business generation through multiple engagements. Home applications have grown intelligent by the help of Internet of Things, since last few years. Brands like Amazon, Google, Microsoft have mastered in them and brought us Home appliances like "Amazon Echo" , "Google Home" and Microsoft is planning to bring "Cortana" to IoT core devices. We might see a future where we can operate many home appliances automatically. These capabilities are going to enhance further and add more to our life. This technology has overwhelming response and yet to see how this technology develops further by increase in it's capability. When you say Intelligent Apps, first thing comes to mind are Apple's - Siri, Google Allo - Voice Assistant. These are VPA's (Virtual Personal Assistants) which are making every day tasks easier by notifying you important events, prioritizing activities and scheduling tasks. This tech has potential to transform the nature of work and working culture. This trend will continue to evolve and expand its instincts with the help of AI and Machine Learning. Gartner has identified major points where every digital business has to posses these new capabilities like information systems, customer experience, analytics, intelligence, IoT and business ecosystems. Organizations have to customize and utilize these technologies in becoming a digital business. Digital Advertising, E-Wallets, E-Commerce are few which belong to this category. Example - E-Wallets are one of the digital platforms which allow us make or receive payments more easily rather than performing through conventional / internet banking. Bitcoin is a decentralized digital / virtual currency developed on Blockchain Crypto-Technology. To keep it simple, encryption techniques are used to generate currency and to identify the digital currency transfers using technology. It is still evolving and being tested in different industries and yet to see how it unfolds further in providing secured transactions. Drones, Hover Boards, 3D-Printing, Autonomous Vehicles, Intelligent Apps and Things are still evolving. We can expect people choosing cloud based applications by default, utilizing VR's or AR's at more than expected rate. Business and Banking transformations are expected. 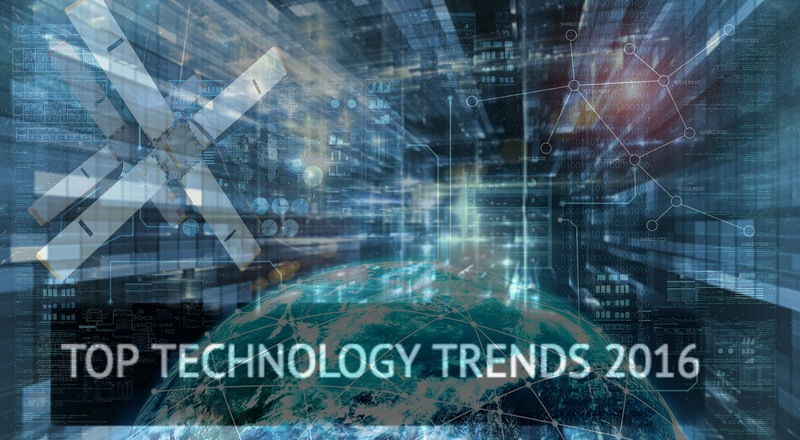 Predicting Future Tech Trends and eagerly waiting to get experienced makes us more excited. Validate your Past and Plan for the New Year 2017 Resolution.